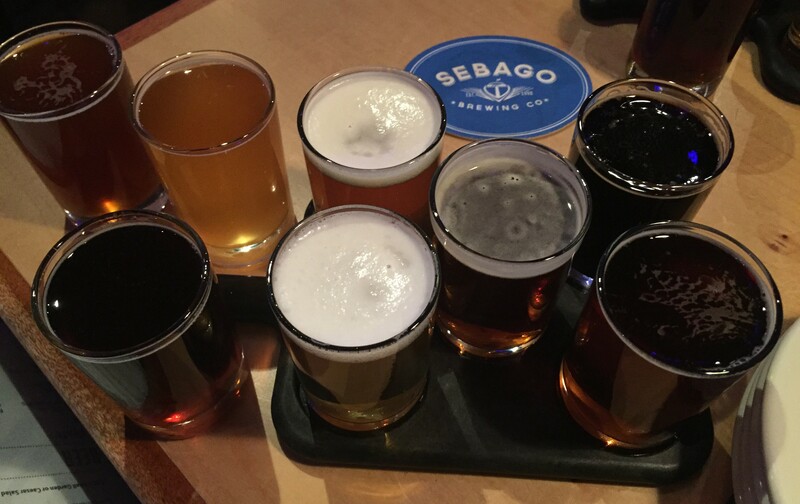 Sebago Brewing Company, Portland Brewpub, ME – Breweries, Wineries and the fun in between! 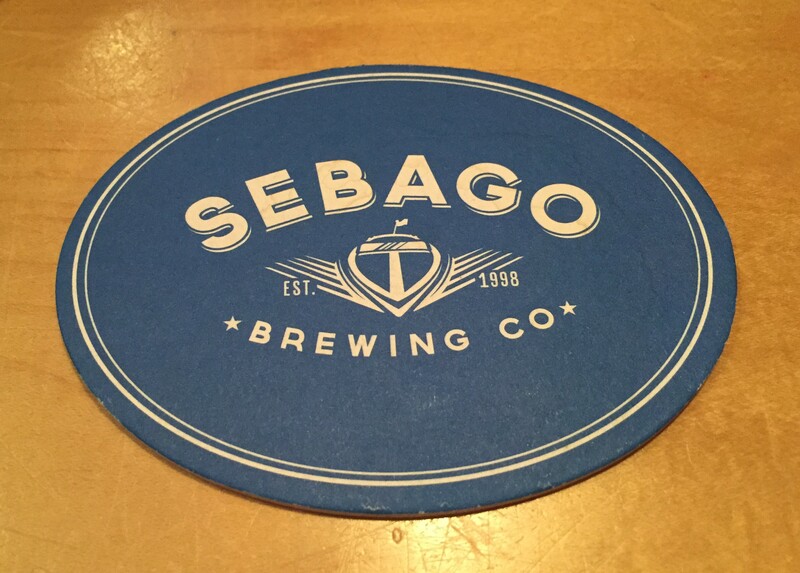 Our last stop during our most recent trip through Portland with Jason and Maureen was The Sebago Brewing Company – Portland Brewpub location. We figured after a long day of visiting breweries in Portland we should finish the trip off with some food, and more beers. 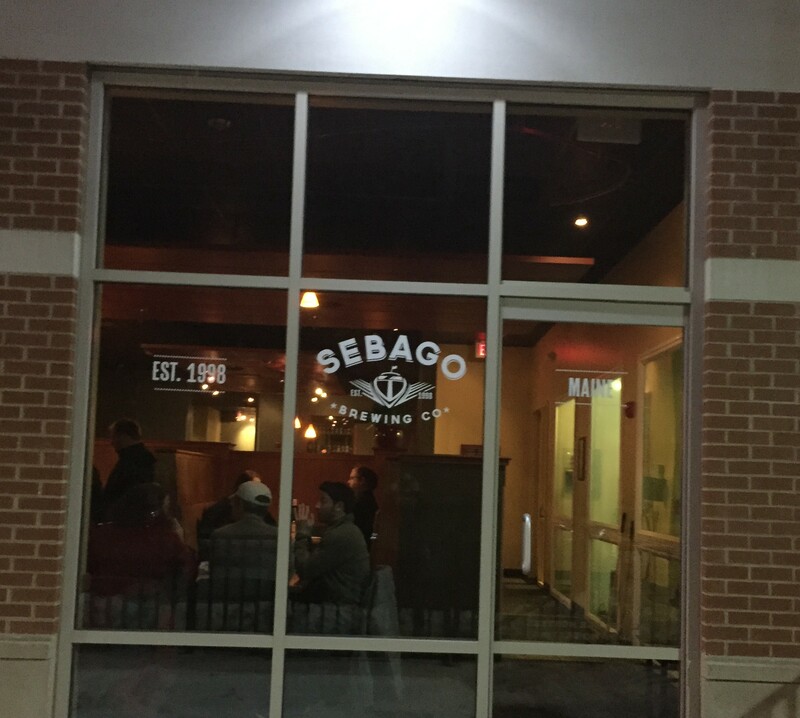 The original Sebago Brewpub opened in 1998. After 6 years of brewing beer out of their brewpubs, they opened the main brewing and bottling facility in Gorham, ME. 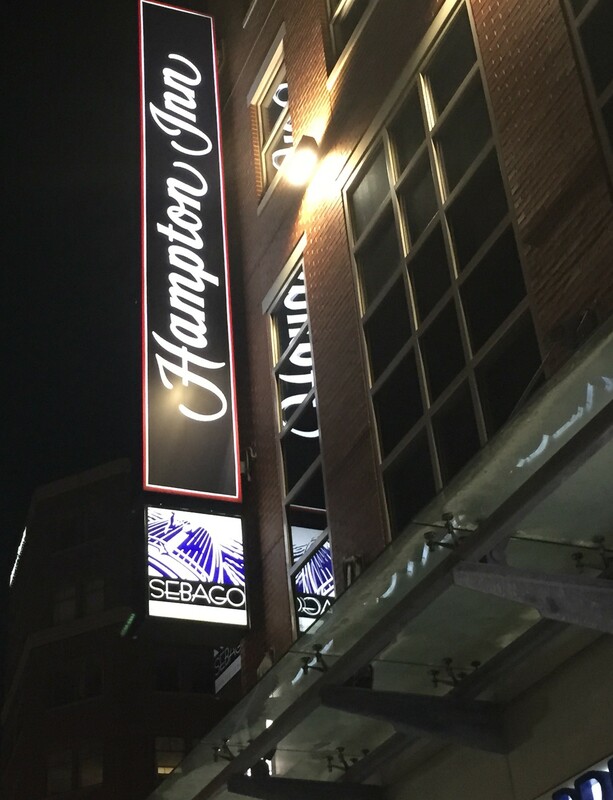 There are 4 brewpub locations and we visited the Portland Brewpub, right Downtown, under the Hampton Inn. It’s actually right around the corner from Shipyard. 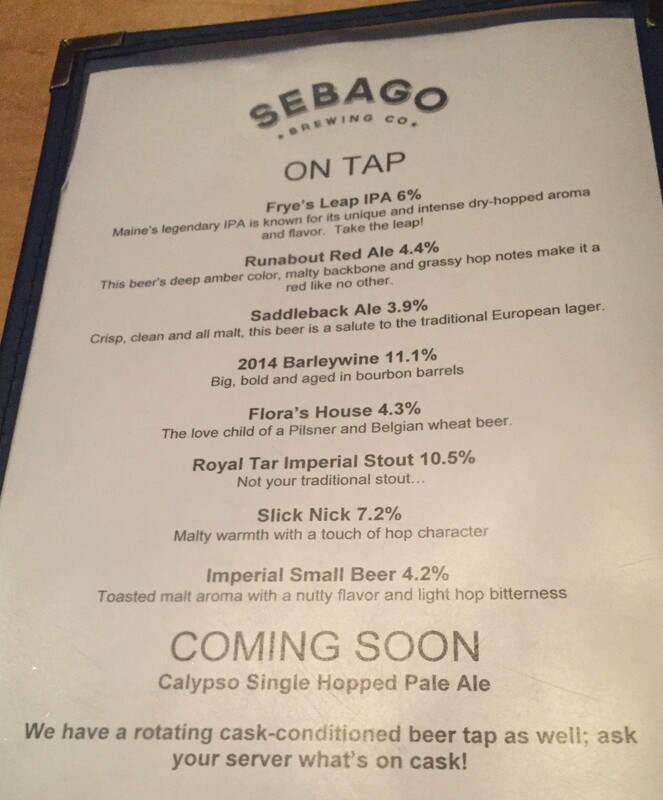 I don’t think we had actually tried Sebago beer before. 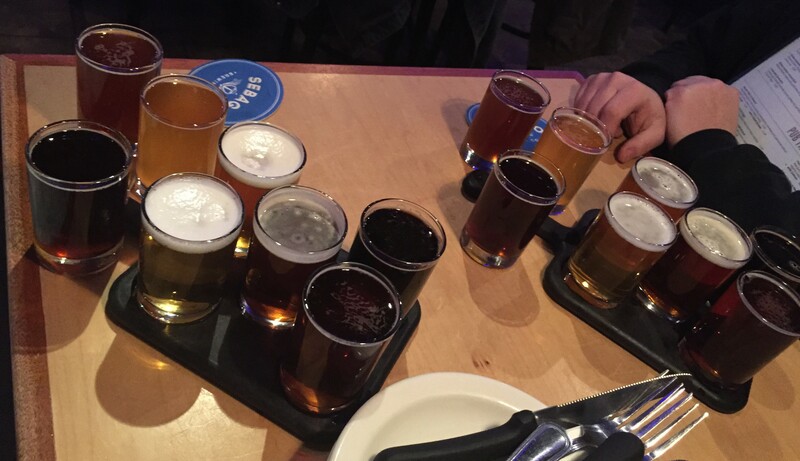 Mark and Jason each ordered their own sampler tray to try all the beers they had on tap. Light beer with a really light taste, not cheap or bad, just an ok taste that is not very flavorful. Fairly standard IPA, good flavor, drinkable, but nothing outstanding. Malty, winter style beer, similar to the IPA in that it has a decent taste but nothing great. 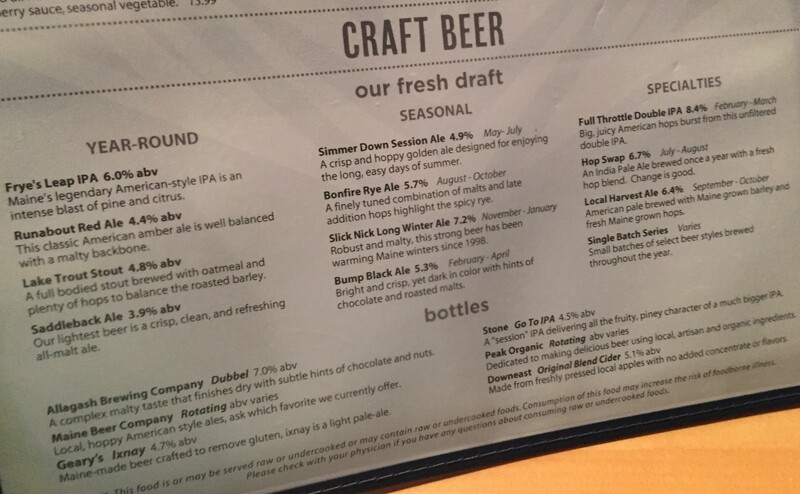 Winter style beers are not Mark’s favorite. Fairly easy drinking amber with a malt base. Only 4.4%. Imperial stout, pretty good flavor, heavy tasting, you can tell by the taste it is a high percentage beer. 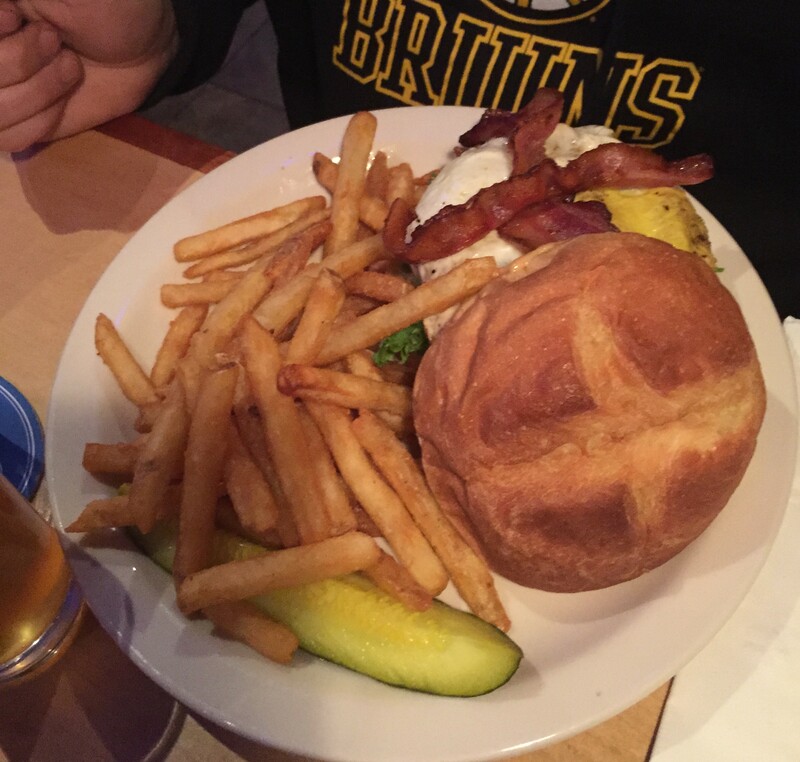 Jason didn’t think it was a good beer to drink while eating, better for sipping on. Described as ‘a love child of a pilsner and a Belgian wheat beer.’ Maureen didn’t think it was that great. Mark liked it, pretty good Belgian flavor, a little on the lighter side. Fairly smooth, nutty flavor, good overall taste. Probably Mark’s favorite. Heavy barleywine, not too enjoyable, bourbon barrel aged, we didn’t really like this one. We ordered Potato Nachos as an appetizer. 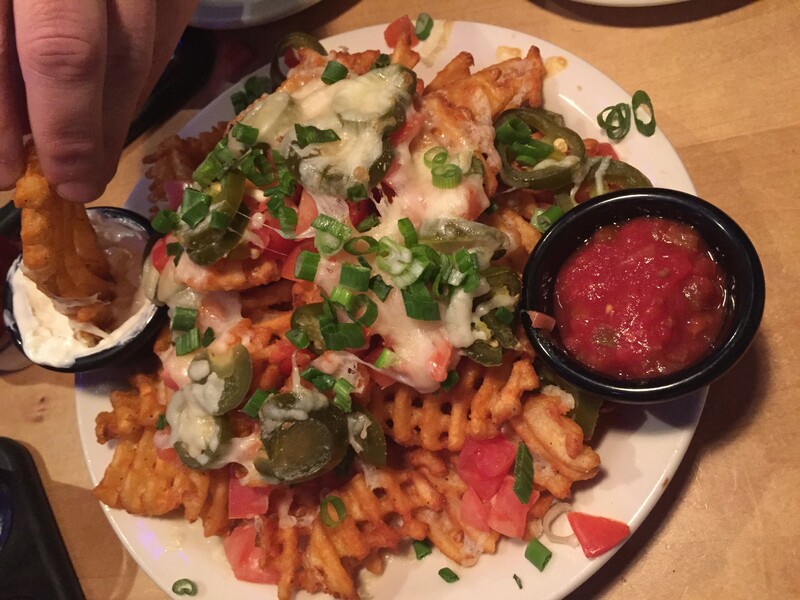 It was waffle fries instead of nachos, pretty good. 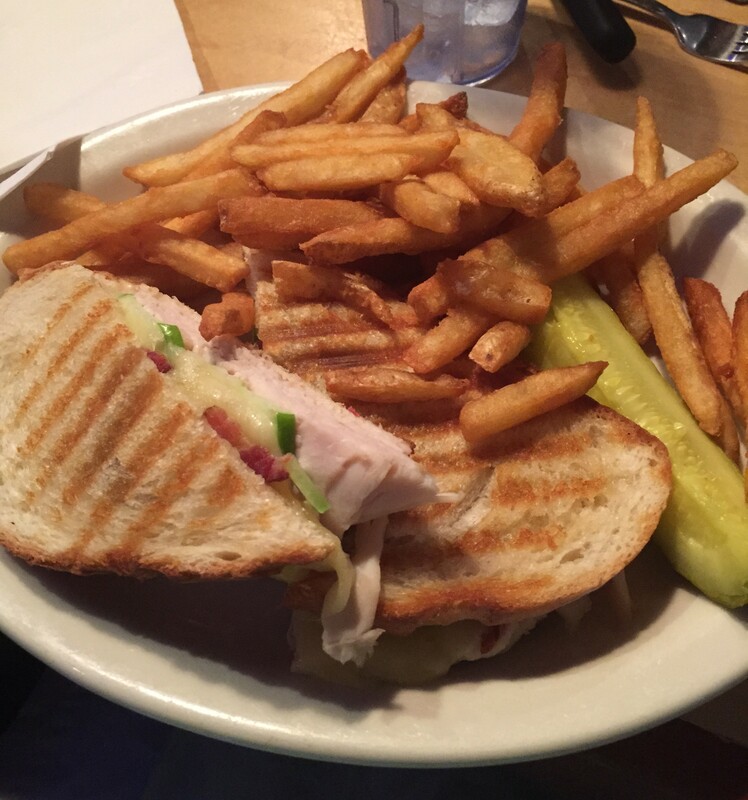 Megan got a Caesar Salad and a Vermont Panini. 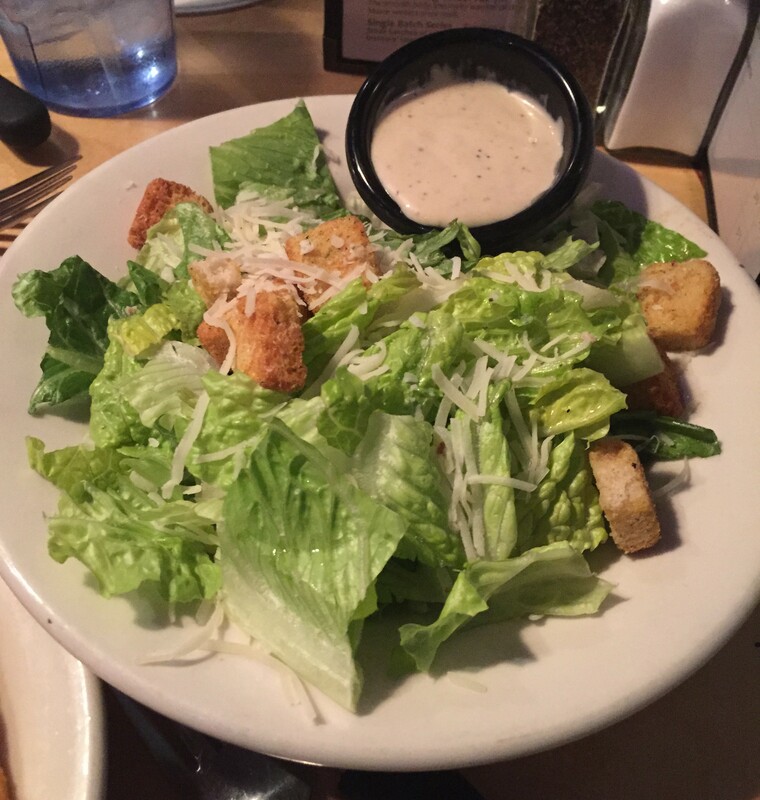 The salad was ok, the panini was good. 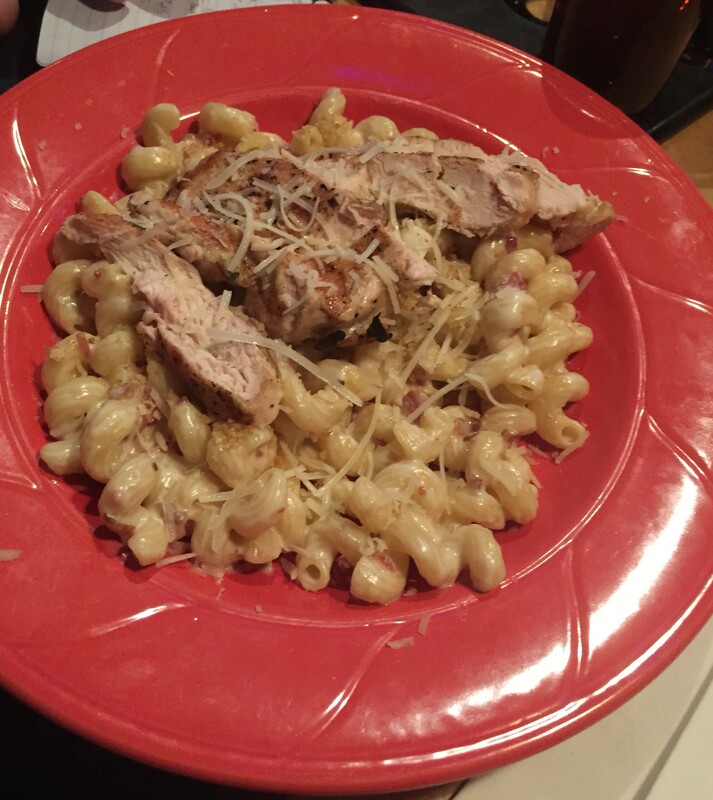 Mark ordered the Bacon Mac and Cheese and added chicken to it. The chicken wasn’t really added to it, it was just put right on top. He just mixed it in, it was really tasty. 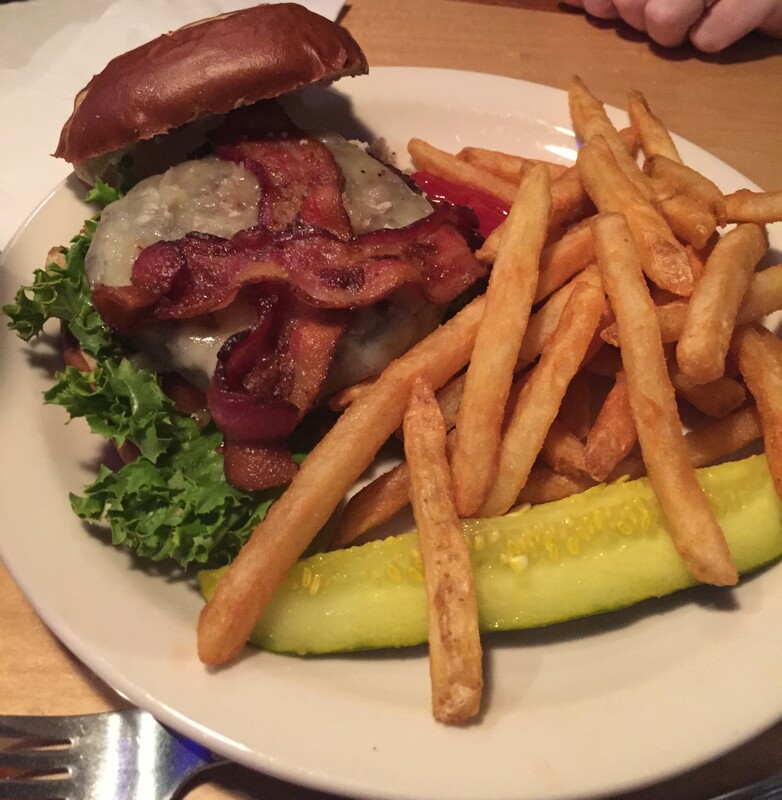 Maureen got the Brewhouse Classic Burger and liked it. bacon on it. He described it as decadent. 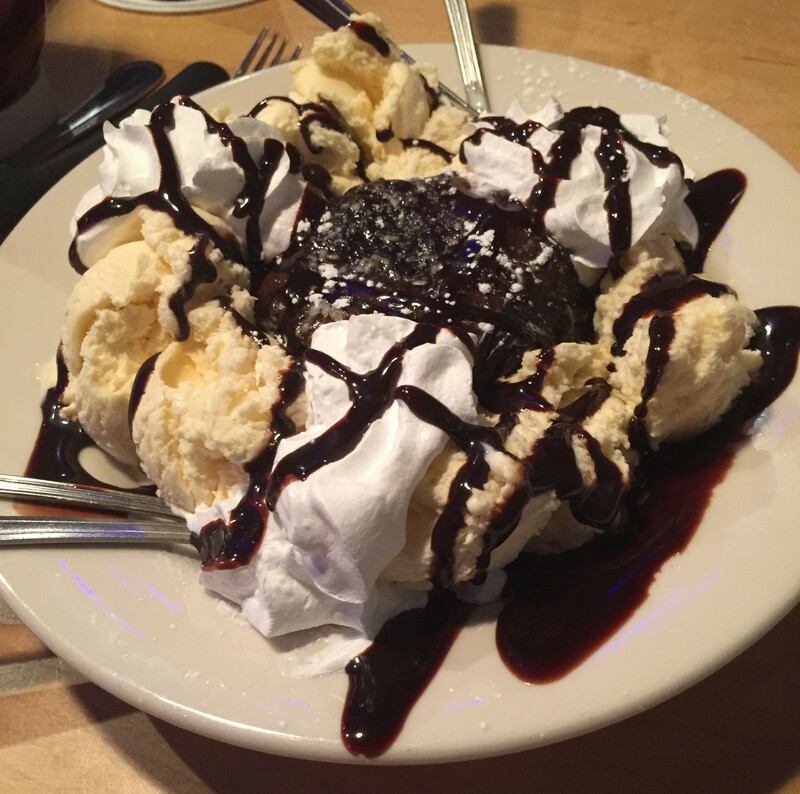 Megan and Maureen wanted desert, so they got a Molten Chocolate Cake to split, which they both really enjoyed.